This article should be cleaned up or improved. The reason is: Drones and Drone mechanics strongly overlap. This article explains what drones are and how they work. For a more detailed discussion of PvP and PvE tactics with drones, see the Using Drones page. Drones are semi-autonomous vehicles launched from larger spacecraft, designed to augment the launching ship's capabilities. All four races use drones (to a greater or lesser degree), so every combat pilot is likely to use them sooner or later. While for most ships drones are used to support their main weapons, there are some ships which use drones as their primary way of dealing damage. In addition, there are drones for more specialized uses, such as mining, electronic warfare, and logistics. Compared to the other main weapons systems in EVE (turrets and missiles) drones provide a great deal of flexibility. On the other hand, most drones need to travel to their target before applying their damage, and can be destroyed by an enemy ship. If you undock with drones in your drone bay, you will see a new window for controlling drones appear on your screen. Through this window you can launch drones from your drone bay, give commands to them once they are in space (for instance, to attack a target, orbit your ship, or mine an asteroid), and recover them (bring them back into your drone bay). This window also shows you if any of the drones you currently have in space are damaged. You cannot control how a drone fights and flies directly; you can only issue commands like "attack that target", in which case the drone will fly to the target you have selected, and start firing on it once it's within weapons range, all without further input from you. You can give commands to each of your drones individually, or to all of your drones at once. If damaged, a drone's shields will slowly regenerate on their own, but damage to its armor and hull needs to be repaired (e.g. by using the repair services at a station, or a remote repair module on your ship). Drones have built-in weapons with effectively infinite ammunition, and don't need to reload. Drones have various attributes that govern how they can be used. The drone control window, showing drones in the drone bay and drones in space. A ship must have a drone bay to use drones. You can find out if a ship has a drone bay, and how big it is, by looking at the Attributes tab in its Show Info window - if it has a drone bay, it will tell you the drone bay's capacity in cubic meters (m3). The size of a ship's drone bay determines how many drones you can carry with you, ready to be launched into space; larger and more powerful drones take up more space in your drone bay. The Tristan has a 40 m3 drone bay, which means it can carry up to eight light drones (which take up 5 m3 each), or four medium drones (10 m3 each), or a combination of the two (e.g. two medium and four light drones). Only drones can be carried in a ship's drone bay; it cannot be used to carry other cargo. While you can, of course, carry drones in your cargo bay (just like any other kind of cargo), you cannot use them if they are not in the drone bay. You can only move drones in or out of your drone bay while docked at a station, or by using a ship/structure with fitting service (e.g. a mobile depot or a Capital Ship). The size of your ship's drone bay is fixed and cannot be enlarged using modules or skills. The other important ship attribute is its "bandwidth" (which you can also check in the Attributes tab of your ship's Show Info window), which represents your ship's ability to control your drones, and is measured in Mbit/sec. Bigger and more powerful drones require more bandwidth, and you can only deploy (ie use in space) as many drones as you have available bandwidth on your ship. Many ships (particularly dedicated drone ships) can carry many more drones in their drone bay than they can deploy at once; this allows you to selectively deploy different types of drones to best match your enemies, or to replace drones which are destroyed in combat. However, irrespective of your ship's bandwidth, you can only only have as many drones in space at once as you have levels in the Drones skill (up to 5 drones at level V). The only exception to this limit is the very rare Guardian-Vexor cruiser, but in every other case you can only ever have at most five drones in space at once. The Tristan's bandwidth is 25 Mbit/s, allowing it to deploy, at most, five light drones in space at once (they need 5 Mbit/s each), but only if the pilot has trained the Drones skill to level V. If it's carrying a mixture of light and medium drones, it could deploy up to two medium (10 Mbit/s each) and one light drone at once, assuming the pilot has trained Drones III. With the exception of fighters (which are only used by capital ships) and special limited edition drones, a drone's bandwidth requirements (in Mbit/sec) is always the same number as its volume (in m3). Your ship's bandwidth is fixed, and is not affected by skills or modules. Drone Avionics (1x): Increases drone control range by 5km per skill level. Advanced Drone Avionics (5x): Increases drone control range by 3km per skill level. Almost all drones (except the stationary sentry drones, mining drones and salvaging drones) have a built-in microwarp drive (MWD), allowing them to travel quickly to engage a target. Once they arrive near their targets, they shut down their MWD, orbit the target, and fire their weapons. This means that, unlike for the other weapons systems in EVE (lasers, projectiles, hybrids, and missiles), drones first have to travel to the target, and then stay within range of it in order to apply their damage. In practice, this means that drones will have difficulty against faster, more agile targets, as even though they may be able to catch them thanks to their MWD, they may not be able to stay within weapons range for long (at their non-MWD speed). Larger drones (medium and heavy drones) in particular are almost useless against fast frigates for this reason. No skill or module affects the orbit speed of drones. Light, medium, and heavy drones, generally for use on frigate, cruiser, and battleship-sized ships, respectively. Sentry drones, which act as stationary, long-range turrets. These drones impair an enemy ship using electronic warfare or similar methods. There are drones for each of the four methods of electronic warfare: tracking disruption (TD), electronic countermeasures (ECM), sensor dampening (SD), and target painting (TP). Additionally, there are drones which drain an enemy's capacitor (energy neutralisers), or reduce a ship's speed (stasis webifiers). These drones assist friendly ships by repairing their shields, armor, or hull. These drones are used to salvage nearby wrecks. These drones mine asteroids or ice for resources. Each race has its own light, medium, heavy, and sentry drones, and they each do one damage type (for instance, all Amarr drones do EM damage, while all Caldari drones do kinetic damage). These are the types of drones people first think when they hear "drones". They are mobile platforms that fly to the target and shoot them once they get close. As long as the target is within the drone control range they can engage. Though travel time may be a problem at long ranges, especially with heavy drones. The faction variants do not just deal different damage types. Minmatar drones are the fastest drones (50% faster than Gallente drones with MWD on), and so excel at chasing fast ships. However, they do the lowest damage. Gallente drones do the most damage (23% more than Minmatar drones), but are the slowest. Amarr and Caldari drones fall between Gallente and Minmatar drones in terms of damage and speed (Caldari drones do a little less damage than Gallente drones, but are a bit faster; Amarr drones do a little more damage than Minmatar drones, but are a bit slower). Additionally, these drones orbit a little further away from their targets, making them apply their damage more consistently, and are a little tougher (+25% more hit points, compared with Minmatar and Gallente drones). Therefore, the four race's drones represent a sliding scale between damage and speed (the percentages in the table below are relative to the worst-performing drone family). Note that the table lists two values for speed: the speed with MWD on (when the drones are chasing a target), and the orbital speed with MWD off (when the drones are orbiting and attacking a target). All drones do the primary damage type. 'Integrated' and 'Augmented' drones do a mix of the primary and secondary damage types. Please note that you can hover over the titles for an explanation of the terms and units. ^ The Gecko is a cross between a heavy and a fighter drone, which was given out for free to every pilot before the Kronos expansion. It can be flown by subcapital ships, but requires 50 Mbit/s of bandwidth (twice as much as a heavy drone) and deals omni-damage (ie its damage is split equally between the four damage types). It requires the same skills to fly as a Tech 1 heavy drone, and there are no Tech 2 or other variants of it. A Faction drone, available from LP stores. They don't require additional skills to use (beyond those required for the Tech 1 drones). They have a very large number of hit points, but slightly lower damage than their Tech 2 counterparts. A Tech 2 drone, which is more powerful (better speed, damage, and hit points) than its Tech 1 counterpart, but requires additional skills to use. 'Integrated' and 'Augmented' drones, which can be thought of as enhanced Tech 1 drone and Tech 2 drones, respectively. These drones are produced from the components found in NPC rogue drone wrecks. They need the same skills to use as Tech 1 and Tech 2 drones, respectively, but have slightly improved stats. The damage they do is split between the race's primary and secondary damage types (unlike all other types of subcapital combat drones, which deal only the race's primary damage type). However, the 'integrated' drones are fairly rare and therefore very expensive. The table below lists the stats of these drone variants, using the Tech 1 drones as a baseline. ^ a b Tech 2 and 'Augmented' drones gain an additional +2% damage for every level of the appropriate racial drone specialization skill (e.g. Amarr Drone Specialization for Amarr drones) you have trained. Sentries are immobile drones that serve as stationary gun platforms. They are carried in a ship's drone bay and launched as needed. However, they cannot move and must be picked up physically at the conclusion of an engagement. At the same size (25m³) and bandwidth (25Mbit/sec) as heavy drones, sentries are powerful, long range damage dealers. Their immobility and somewhat low tracking speeds makes them most effective against slower, larger targets, and generally they are deployed from battleships or similar combat vessels. Sentry drones begin with approximately 2800 HP of defense (shields, armor, structure). They are incapacitated after being 75% damaged. Although each type of sentry drone does the damage typical of its racial affiliation, drone choice often has to do with relative damage, range, and tracking. These are summarized here, with the detailed numerical data shown next. The Warden has the longest range. Targets are generally drawn straight towards it from far away, which offsets its slow tracking and smaller damage factor. The short-ranged Garde has the fastest tracking and damage factor. This makes it more effective than the others as a close defense. The Bouncer and Curator are in the middle and somewhat comparable; the Curator having a higher tracking speed and slightly higher damage factor, while the Bouncer has a longer range. Like the light-heavy drones, the sentry drones too have faction variants. Though no 'integrated' or 'augmented' sentries exist as only the navy variants are available. T2 drones do the same base damage as do T1s. However, they have longer range and better tracking. T2 sentry drones gain additional damage bonus from the trained racial drone specialization skill level. Faction variants do the same damage as T1 and T2 drones. They have the same range as T2 sentry drones, but higher tracking speeds and are stronger defensively. T2 drones are boosted by the racial drone specialization skill; faction drones are not. ^ Tech 2 sentry drones gain an additional +2% damage for every level of the appropriate racial drone specialization skill (e.g. Amarr Drone Specialization for Amarr drones) you have trained. Most players recommend treating sentry drones as if they were a second set of guns. Deploy a full flight within range of your targets and turn them on - and then then use your ship to defend the drones, shooting the smaller, faster ships that will be the first to arrive. Given the power of the drones, the larger, slower ships will likely be killed before they can arrive. If they do arrive, however, and if any drones are damaged, pick them up and replace them. (Remember that sentry drones cannot fly back to your ship ... you must physically go and get them.) If things get too hot, pick up all your drones, run out to range, drop the drones again, and continue the fight. This approach is is sometimes described as boring, but it is effective and relatively safe. Sentry Drones trade mobility for range. Their damage is somewhat lower than that of heavy combat drones, but heavy drones waste considerable time flying from enemy to enemy whereas the sentry drones can retarget new enemies very quickly. Each race has three EW drones, based on their light, medium and heavy combat drones. The type of EWAR is indicated by a two-letter abbreviation in the drone's name, while the size is indicated by the numbers 300 (small), 600 (medium) and 900 (large). So, for example, the small sensor dampening drone is called a Hobgoblin SD-300 (based on the Hobgoblin light drone), while the medium tracking disruption drone is called a Valkyrie TD-600 (based on the Valkyrie medium drone). Unlike module-based EWAR, the strength of their EWAR is not affected by ship bonuses, skills, rigs, or modules. Also, since the EWAR effects are stacking penalized with other EWAR drones and module-based EWAR, so, starting from the the third or fourth EWAR source, additional drones will have very little additional effect. ECM drones (like ECM modules) are not stacking-penalized. EWAR drones have the same bandwidth and drone bay space requirements as their combat drone counterparts, but tend to be more fragile. In order to use EW drones you need to train Advanced Drone Avionics. Additionally, each class of EW drones needs training in its EWAR skill (e.g. tracking disruption drones need the tracking disruptor skill Weapon Disruption). Tracking disruption drones cannot be scripted (i.e. they will always reduce both an enemy's tracking speed and their turret range). For comparison, a Tracking Disruptor I module has a -15.3% reduction in enemy tracking and range (and can be scripted to -30.6% in either one or the other). This can be increased to -19.1% with all skills at level V, and -26.3% when flying a dedicated EWAR ship (e.g. an Arbitrator) (-52.6 with scripted EWAR ship). Tracking disruption drones need Weapon Disruption III. ECM drones act like multispectral jammers (i.e. they have the same jam strength against all four sensor types). For comparison, the Multispectral Jammer I module has a jam strength of 2, which can be increased to 2.5 with all skills at level V, and over 4 when flying a dedicated EWAR ship (e.g. a Blackbird). When a ship is jammed by ECM drones they can only target the ECM drones that jam tem allowing the drone owning ship to avoid target locks. ECM drones need Electronic Warfare III. Sensor dampening drones cannot be scripted (i.e. they will always reduce both an enemy's targeting range and their scan resolution). For comparison, a Remote Sensor Dampener I module has a -13.7% reduction in enemy targeting range and scan resolution (and can be scripted to -27.4% in either one or the other). This can be increased to -34.2% with all skills at level V, and -47.1% when flying a dedicated EWAR ship (e.g. a Celestis). Sensor dampening drones need Sensor Linking III. For comparison, a Target Painter I module increases the enemy's signature radius by 20%. This can be increased to 25% with all skills at level V, and 34.3% when flying a dedicated EWAR ship (e.g. a Bellicose). Target painting drones need Target Painting III. Similar to EWAR drones, these perform auxiliary tasks in combat. Just like EW drones, ship bonuses, skill bonuses, rigs, or modules do not increase the amount of capacitor neutralized or the speed reduction. These drones drain a fixed amount of energy from the target ship's capacitor (working in a similar manner to energy neutralizers, also called "neuts"), and are not stacking-penalized. They come in three sizes, are based on Amarr combat drones, and operate on a 6-second cycle (like small neuts). For comparison, the Tech 1 small, medium and large Energy Neutralizer modules neutralize 45 GJ, 75 GJ, and 125 GJ every 6 seconds, respectively. Energy neutralizing drones are occasionally used to cap out tackle frigates or to keep a neuted target at zero capacitor. Just like EW drones, these drones need Advanced Drone Avionics and the EW skill Capacitor Emission Systems III. Stasis webifier drones work much like Stasis Webifier modules ("webs"), slowing the sub-light speed of the target, making them easier to hit and damage. They are stacking-penalized with other SW drones or with normal web modules. For comparison, a Stasis Webifier I module reduces the target's speed by 50%. To use these drones, train Drone Navigation and Propulsion Jamming III (which is also needed for stasis webifier modules). These drones repair their targets. Unfortunately, you cannot target your own ship, and therefore you can't use your logistics drones to repair your own ship (you can, however, use them to repair your own drones). There are Tech 1 and Tech 2 drones, in three sizes (light, medium and heavy, each based on the respective combat drone), which repair either shield, armor or hull damage. The Tech 2 drones receive a 20% boost to repair amount, hit points, speed, and orbital velocity, but require Repair Drone Operation V.
The hull repair drones are half as effective as the shield and armor counterparts. All logistics drones need Repair Drone Operation as well as the skills for remote repair modules ( Shield Emission Systems, Remote Armor Repair Systems, and Remote Hull Repair Systems, respectively). For comparison, the small, medium and large remote shield and armor repair modules repair 80 HP, 160 HP, and 320 HP every 5 seconds, respectively. Salvage drones work like Salvager modules, and extract salvage from the wrecks of destroyed ships. The Salvage Drone I (the only variant) needs 5 m3 of drone bay space and 5 Mbit/s of bandwidth (like a light combat drone). It has a lower chance to salvage wrecks than the salvager modules (3% base access difficulty, compared with 5% and 7% for the Tech 1 and Tech 2 modules, respectively). This can be increased by training Salvage Drone Operation, allowing them (if trained to level V) to salvage any wreck in EVE except for advanced Sleeper wrecks. Their chance to salvage cannot be improved by other skills, or by modules, rigs or implants. Just like for salvager modules, salvage drones do not loot wrecks; if a wreck containing loot is salvaged, the loot is left in a container in space. Salvage drones can automatically salvage any nearby (up to edge of the player's drone control range) wrecks, as long as they belong to the player or their fleet/corporation. Additionally, they can be specifically ordered to salvage wrecks belonging to other players (marked in yellow on the overview), although this must be done manually for each wreck. When a drone successfully salvages a wreck, it will return to your ship to drop off the salvage (into your ship's cargo bay) before immediately heading back out into space. Salvage drones don't have a MWD, and are therefore are very slow (about 10% slower than the slowest heavy drone), so salvaging more distant wrecks may take some time. Making salvage drones salvage wrecks automatically can be tricky. If you target a wreck and command your drones to salvage it they will not move to a new wreck after they are done. Instead you need to have no wrecks targeted and then select a wreck (by clicking), then command your drones to salvage. After this the salvage drones will keep on salvaging all wrecks that are in range. As their name suggests, these drones mine ore from asteroids. Mining drones will mine the targeted asteroid for one cycle (60 seconds), then return to your ship, drop off the mined ore (into your cargo bay or ore hold), and fly back to the asteroid to continue mining. Since these drones don't have a MWD, they are very slow (about half as fast as heavy combat drones), and therefore it's important to keep your ship as close as possible to the asteroid they are mining, to avoid losing too much time in transit. Training Mining Drone Operation and Drone Interfacing improves their mining yield, and training Drone Navigation increases their speed. For comparison, a Miner I mining module can mine 40 m3/min of ore. There are no mining drones for gas harvesting. ^ The medium and large neuts operate on 12 and 24-second cycles, respectively, but this way of presenting the numbers makes comparisons easier. Ice harvesting drones gather ice from ice asteroids. These drones operate identically to mining drones, except their cycles are longer and they only harvest one unit of ice at a time. For comparison, an Ice Harvester I module has a cycle time of 220 seconds. Drones (1x, 30k ISK): Allows you to operate 1 drone per level (up to 5 at level V). This is the foundation skill of any drone pilot, should be trained to at least level III as a top priority, and to level V soon after (at latest when you start flying ships with 25m3 drone bays or larger). These skills allow you to use light, medium, heavy, and sentry combat drones, respectively. Level V is needed for Tech 2 and 'Augmented' drones; all others only need level I. Additionally, these skills increase the damage of their respective drone group by 5% per level. Note that you don't need any skills to load drones into your drone bay; you only need the skills to launch and control them. Light Drone Operation (1x, 75k ISK). Requires Drones III. Medium Drone Operation (2x, 125k ISK). Requires Drones III. 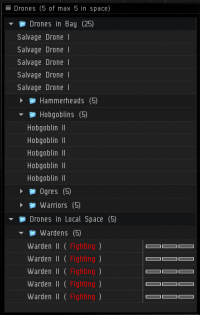 Heavy Drone Operation (5x, 500k ISK). Requires Drones V.
Sentry Drone Interfacing (5x, 650k ISK). Requires Drones V, Drone Sharpshooting IV, and Drone Interfacing IV. These are the "drone support skills", which improve the performance of your drones. Nearly every skill requires Drones to level IV or V.
Drone Interfacing (5x, 750k ISK): Increases your drones' damage (and mining yield for mining drones) by 10% per level. Train this to level IV quickly to make your drones much more effective (level IV is the equivalent of having two extra drones in space); the long train to level V is worth it if you're specializing in drones, or as a prerequisite for capital ship drones. Drone Durability (5x, 100k ISK): Increases the shield, armor, and structure hit points (HP) of your drones by 5% per level. Useful to make (particularly your more expensive) drones live longer, but is not a high-priority skill. Drone Avionics (1x, 60k ISK): Increases your drone control range by 5km per skill level, and allows you to use Drone Link Augmentor modules (which increase your drone control range even further). Training this skill is vital for sentry drone users, and moderately useful for other combat drones. Advanced Drone Avionics (5x, 600k ISK): In addition to unlocking EW drones (see below), this skill also increases your drone control range by 3km per skill level. Drone Sharpshooting (1x, 150k ISK): Increases your drones' optimal range (but not their falloff) by 5% per level, and allows you to use Omnidirectional Tracking Link and Omnidirectional Tracking Enhancer modules (which boost drone optimal range and tracking). This skill is vital for sentry drones, but less important for other drones. Drone Navigation (1x, 100k ISK): Increases your drone's microwarpdrive speed by 5% per level, and allows you to use Drone Navigation Computer modules (which increase it even further). This skill is very important for users of heavy drones (and of no small benefit to light and medium drones). These skills are requires to use each faction's Tech 2 and 'Augmented' drones. Additionally, they increase the damage of these drones (but not other drone types) by 2% per level. These skillbooks come from LP stores and therefore vary in price; they require Drones V.
These skills unlock the electronic warfare (EW), combat utility, logistics, and mining drones. Mining Drone Operation (2x, 50k ISK): Unlocks mining drones and increases their yield by 5% per level. Repair Drone Operation (3x, 200k ISK): Unlocks logistics drones and increases their repair amount by 5% per level. Requires Drones V.
Salvage Drone Operation (4x, 500k ISK): Unlocks the salvage drone and increases its chance to salvage by 2% per level. Requires Drones IV. Advanced Drone Avionics (5x, 600k ISK): Unlocks EW and energy neutralisation drones. Also increases your drone control range (see above), and requires Drones V.
Lastly, if you're flying a drone boat, training its spaceship command skill will often improve the performance of your drones considerably. For instance, if you're flying a Gallente Vexor cruiser, training Gallente Cruiser gives a 10% bonus per skill level to your drones' damage and hit points. Unfortunately, these bonuses don't transfer to other ship classes or factions - your Gallente Cruiser skill won't help you to fly an Amarr Prophecy battlecruiser, or improve the performance of its drones - but if you're planning to flying a particular ship for a longer period of time, then investing skill training time here can be very beneficial. Most drone modules fit into mid and low-slots, leaving the high-slots free for weapon or utility modules. All drone-enhancing modules affect both sub-capital drones and capital fighters equally. Drone Link Augmentor increases your drone control range by 20km (24km for the Tech 2 variant). This module is particularly useful for sentry drones (allowing them to snipe distant targets), but less useful for other drones, as the travel time usually precludes using drones at long ranges. Fighter support unit can only be fitted to capital ships, and allows you to launch one extra drone. This module, combined with the skill bonuses that carriers and supercarriers get, allows you to field large numbers of drones at once. Drone Navigation Computer increases your drones' microwarpdrive (MWD) speed by 25% (30% for the Tech 2 variant). Note that this doesn't affect their non-MWD speed (i.e. it will help them reach a target faster, but won't help them while orbiting the target). This module is particularly useful for heavy and fighter drones, allowing them to better catch up to faster ships. Omnidirectional Tracking Link increases your drones' tracking speed and weapon range (optimal and falloff). Great for sentry drones, less used for other drones although it can still improve their damage application, especially if you use your drones against smaller ships than intended (e.g. medium combat drones versus frigates). Just like turret tracking computer modules, these can be loaded with scripts to double either the tracking or the range bonus, at the cost of eliminating the other bonus. Unlike low-slot Omnidirectional Tracking Enhancer modules, they need to be activated to provide a benefit, and they need a little capacitor energy to run. Drone Damage Amplifier increases the damage your drones deal by 16% (23% for the Tech 2 variant). Keep in mind that (just like other damage-enhancing modules) its effects are subject to stacking penalties; nonetheless, most dedicated drone ships will fit at least one of these modules. Omnidirectional Tracking Enhancer increases your drones' tracking speed and weapon range (optimal and falloff). It's similar to the mid-slot Omnidirectional Tracking Link module, but provides slightly higher bonuses to range, and slightly lower bonuses to tracking. Also, it cannot be scripted, and is a passive module (i.e. it does not need to be activated and uses no capacitor energy). Various rigs improve drones byt the expense of the CPU of the ship. Drone Control Range Augmentor Increases drone control range by 15km (20km for the Tech 2 rig). Drone Durability Enhancer Increases drone hit points (shield, armor and structure) by 20% (25% for the Tech 2 rig). Drone Mining Augmentor Increases mining drone yield by 10% (15% for the Tech 2 rig). Drone Repair Augmentor Increases the amount repaired by repair drones by 10% (15% for the Tech 2 rig). Drone Scope Chip Increases drone optimal weapons range by 15% (20% for the Tech 2 rig). Drone Speed Augmentor Increases drone microwarpdrive (MWD) speed by 10% (15% for the Tech 2 rig). Sentry Damage Augmentor Increases the damage done by sentry drones by 10% (15% for the Tech 2 rig). Stasis Drone Augmentor Improves velocity decrease cause by your stasis webifier drones by 15% (20% for the Tech 2 rig). There are no "normal" implants for improving drones. Though four limited time implants exist that were obtainable from past events. This page was last modified on 11 April 2019, at 00:31. This page has been accessed 340,166 times.